What an incredible time of year! The gradual change in weather instinctively reminds me of all the amazing people and things in my life. I love that I’m able to share my artwork with you each and every day, and I’m thrilled that I have an amazing team of artists who share their work with me. My team’s blog hops are a highlight for me – I’m always amazed at the projects they share – such amazing talent from wonderful people. Welcome to InKing Royalty’s November Blog Hop! Today’s hop is filled with inspiring projects that share the gratefulness of the season. Whether you are ready to celebrate Thanksgiving this week or just feel reflective of the things that make you thankful, we are sure you’ll find great inspiration from our talented team members. After you read my post, I hope you’ll hop over to the next person on the list at the base of this post. So the card is not an over-the-top Autumnal project, but it really defines my style of stamping – lots of sweet layers of cardstock with very little, overall fuss. Still, the entire project is planned out and every element has a purpose. So Many Great Products. I didn’t realize it until after my card was complete, but my project combines so many of my favorite products – Happy Happenings Stamp Set, Go Wild Designer Series Paper, Circle punches (I used the 2″ Circle punch), White Stampin’ Emboss Powder and Archival Basic Black Ink. Without even trying, I managed to get all of these things – for which I am very thankful – into one card. Still, the card is super-simple and (in my humble opinion) very appealing. 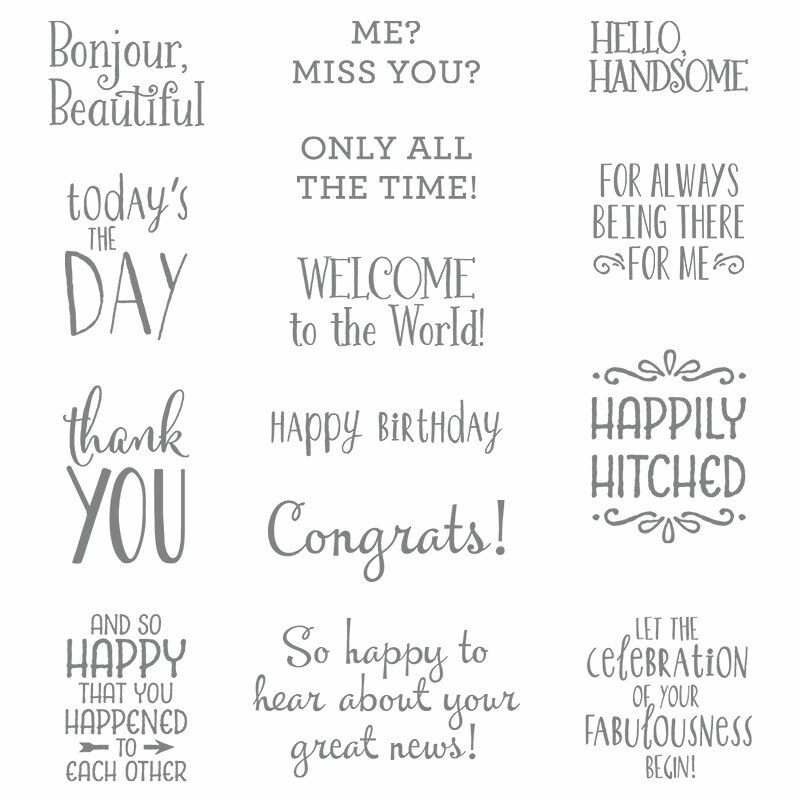 Happy Happenings stamp set, Stampin’ Up! Finding Balance with Shapes and Colors. It only took a few measurements and a little careful trimming to crop the right size panel for the backdrop of this card and the right thickness for the band of cardstock down the right side. I knew I wanted a Basic Black circle for the “thank you” sentiment and to continue the sentiment on the Tip Taupe band. I just wasn’t certain about how big the circle should be or where to place it for perfect balance. I originally cropped the sentiment with a 2-1/2″ Circle punch (too big) and re-cropped it with a 2″ Circle punch (just right). I positioned the circle a little to the left of the band – which happened to be the center of the card front. Everything seemed perfectly balanced there when I squinted. 🙂 If you missed my video about my “patented” squinting technique, you can see it here. Thank you for stopping by today. I hope you’ll hop along to the next stop on the blog hop, Jennifer Spiller at Westside Paper Creations. There’s lots of inspiration to be found in this group – and you don’t want to miss it! Definitely a great card design to make a “bunch” to have on hand! Thank you, Brian. I love this card! Great color combo and layout…as always! I am grateful for a peaceful morning, drinking my coffee and enjoying the awesome cards on your blog hop! I love the use of neutrals and the simple sentiment combined with great pattern! This card is “totes adorbs”, Brian! Love the neutrals and that gorgeous paper! Great layout, too! Love it! Can never go wrong with neutrals, especially Tip Top Taupe! Very smart with lots of style. WOW Brian – you have surrounded yourself with very artistic people and it’s so much fun to hop the blogs and see what everyone is doing. Your design is meticulous as always my friend, and oh so beautiful. So clean and simple, but still so gorgeous! Love it! I have learned so much from you–thank you for sharing your talent and for being so supportive! I love being a part of your team!!! Neutrals, gotta love-um! Totally love it. As always, clean and simple and beautiful, Brian! I envy your talent! Love, Love, Love the color combo, stamp set and layout Brian! What a great card. Thank you for hosting the blog hop today. Can’t wait to check out everyone else’s works of art! I’m So Grateful to be part of your team. Your cards are inspiring and this one is no exception. Besides all that, I’ve made a pretty great friend in the process. Thanks for all you do. Sorry I am late….but was busy on Thanksgiving Day and have been taking it easy this weekend! Great card and now going through the blog hop….thankful for you and your team! So classy! Love this layout with its sleek lines.